"Nothing in his life became him like the leaving it." Though I basically detest country music, I happen to be obsessed with the amazing musical legacy of Johnny Cash. When Cash passed on in mid 2003, it happened to parallel the release of the little-seen The Last Days of Frank and Jesse James, a less than stellar part of the Johnny Cash legacy. Teamed with other musical legends that include Kris Kristofferson, Willie Nelson, and even Cash's wife, June Carter, the film is a nice showcase for the talent involved, but the script and direction seem to distract from the decent performances. Taking place long after their days of robbing trains and banks were behind them, The Last Days of Frank and Jessie James focuses on the lives of Frank (Cash) and Jesse (Kristofferson) and the different paths that their lives took up until their final moments. Frank has settled down with a family in a small town in Tennessee, made a life as a farmer and sometime poker player and is known to associate with the political elite. When Jesse comes to visit Frank in his new life, it does not take long until their old habits return, and soon the government is on the hunt for them. In a purely historical sense, the filmmakers do a fine job of recreating the events that transpired until each of the James brothers lives ended in different ways. The film also benefits from some nice production values that seem out of place in a made-for-television movie. The atmosphere lends a certain air to the proceedings, making the story seem grittier than perhaps it deserves, given the weakness of the script and direction. The problems with the script are not limited to one single fault, but the lack of compelling dialogue does not help matters in any way. The solid performances—the looks and gestures of Cash and Kristofferson especially—do a much better job of conveying sadness and other emotions than this weak script could ever dream of doing. Image Transfer Review: Presented in its original 1.33:1 full-frame aspect ratio the transfer for this DVD is better than I had expected. Colors show a slight amount of bleeding; black levels carry only a hint of grain, yet they offer some solid depth at times. This is not an eye-popping transfer but, given the age and origin of the source material, I was certainly impressed. Audio Transfer Review: The Dolby Surround track offered is, as one might expect, dialogue-centered. The center channel does a fine job of recreating the dialogue with no dropouts or distortion evident. Sadly, the rest of the speakers offer no real activity. Extras Review: No extra features have been included for this DVD. 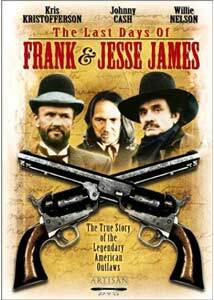 As a showcase piece for Kristofferson and Cash, The Last Days of Frank and Jesse James is a must for their fans. But there is not enough to recommend the film aside from the performances and some nice technical aspects. It does not harm the legacy of the James brothers, but it does a disservice to anyone wishing to seek true insight into their lives.